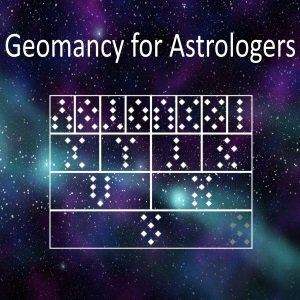 Rediscover geomancy, astrology's long lost daughter! While geomancy’s earliest origins arguably lie in Arabic traditions, it swiftly became popular across Europe in the late medieval period, as well as bearing many similarities to traditional African forms of divination. Likewise, the mathematics underlying geomancy contributed to the development of calculus and, eventually, binary code and the computer chip. Finally, the talismanic use of geomantic figures was considered by many Renaissance magicians to bridge a divide between divination and operative sorcery: offering a range of elemental, planetary and zodiacal magical techniques. This workshop will explore some of these ways in which various divination tools can be used in operative astrological magic. Although geomancy has suffered a decline in status in the modern age, Dr. Alexander Cummins – a historian of magic and a practicing geomancer – hopes to help remedy that! In this introductory workshop we will ground ourselves in the history, practice and magic of this art. Whether you are a professional astrologer, a seasoned card-reader, or a newcomer to divination tools and techniques, this class will offer you further useful skills and resources for your own practice and understanding. Dr. Alexander Cummins is an historian of early modern magic, astrology, and culture. His first book, The Starry Rubric: Seventeenth-century English Astrology and Magic was published by Hadean Press in 2012. He has also written on the cultural history of Apocalypse, occult botany and magical herbalism in the grimoires, the material history of amulets, planetary sorcery, necromancy, and various forms of folk magic. He curates a storehouse of early modern occult texts scanned from archives at grimoiresontape.tumblr.com. Kepler College received its training in how to teach astrological studies from 12 years in the stringent world of academia and government regulations. We took the lessons in excellence from that experience and translated them to provide our current educational program for everyone who is serious about their astrological development. 3. Courses for Certificates and Professional Diploma in Astrology. These offerings consist of intensive in-depth courses for astrologers who want a structured educational environment. Students will have an online course website, assignments, regular live online meetings and lots of feedback to ensure that they can use what they have learned. Courses are either 5 or 10 weeks in length. Students spend at least 8-10 hours per week on the material presented. The Certificate and Diploma program introduces students to a variety of astrological approaches and techniques. This way students can expand their choices and find where their passion for astrology truly lies. In addition, students will have multiple teachers through their courses, giving them the opportunity to ask questions about how different astrologers approach their practice. Along with their courses, students in the Certificate and Diploma Program will have access to an online library, a student resources section and the ability to form their own support groups as they develop their skills, as well as classes and support for establishing their own astrological business. Kepler College started in 1992 as wild dream by astrologers seeking to create a unique educational institution for astrological studies. It first opened in 2000 as an academic college authorized by the State of Washington to grant degrees. After the economic downturn of 2008, the academic side closed down - but our goal of bringing together the best instructors from different branches of astrology to build a superb online environment for astrological education remains! Kepler also has one of the largest astrological libraries in the Pacific NW just a few miles north of Seattle, WA. Whether online or in person - we hope you will visit us!